Magic Ink on the Eastech printers instead of UV-cured. 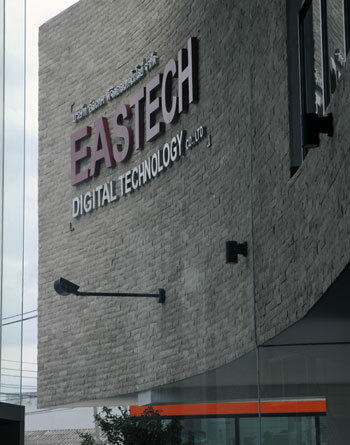 Eastech is a company with an office and factory in Taiwan, an attractive modern headquarters in Thailand, and affiliations with an ink company in Asia. Robert Pan is the innovative force behind this company. Wasana Pongwattanasuk is the key person you also (used to) see at their trade show booth all over the world. Eastech has exhibited Mutoh-related solvent printers for many years in the US and Europe, Then briefly they exhibited the Octra and Scutum UV-cured flatbed printers. Again, certain parts appear to be related to Mutoh Japan but the printer otherwise came from Eastech; their new factory is in Thailand. For the last year (2007) Eastech has moved away from UV-cured ink, including a short-lived relationship with GraphicsOne, who briefly tried to sell an Eastech UV printer as the Fuzion UV. Then there were years that no Eastech booth appeared either in US trade shows or in Europe, though there was one brave German distributor at FESPA Geneva 2008. View of where the "Magic Ink" is placed on Eastech printer at Fespa Trade Show 2007. During 2007 Eastech introduced an ink that they called “Magic Ink”. Originally I had the impression this was a water-based ink, but others have suggested it is a kind of lite or eco-solvent-based ink from either Japan or Korea. Others suggested it was a dye-based solvent ink (not pigmented). The samples include literally every material you could possibly desire to print on: glass, ceramic tiles, vinyl, etc. But everyone had many questions: What about pre-coating? The original brochures mentioned pre-coating (primers). What about abrasion resistance? Can they withstand cleaning? The chemical components of this ink are not widely known either. When I speak with other people in the industry, they say they have not received adequate answers on these questions. So I went to Taiwan to visit the Eastech headquarters there. Unfortunately there was a conflict in schedules and after flying all the way to Asia, there was no one in Taiwan to receive me at Eastech. Naturally this was a bit of a surprise. But I spent the week visiting GCC elsewhere in Taiwan instead. Three reports on GCC UV printers resulted from this visit. I then flew to Seoul where I visited both D.G.I. (solvent printers) and Dilli (Neo Venus, Neo Plus, and Neo Titan UV printers). If you look closely at an Agfa :Anapurna UV printer you quickly notice that the Agfa UV printers share most of the interior chassis with Dilli printers. Eastech now has an impressive headquarters building in Bangkok, Thailand. This is where I spent two days testing and evaluating both their textile printer and their Magic Ink printer. The resulting FLAAR Report will be out shortly. It was eventually possible to get an appointment to visit the new Eastech headquarters in Thailand in July 2008. I am very interested in unusual inks that can print on “everything.” But we cannot recommend any ink unless we know more about it. The first thing I learned during my visit is that the present ink is third generation, and a fourth generation ink will be available later in 2008 or 2009. So today there is no need to pre-coat most absorbant materials with a primer. To document this, we all went together to the local equivalent of a Home Depot and got a diverse variety of materials off the shelf. But as is normal with any ink, you naturally need top-coating on slippery polished surfaces. In other words, unless the Magic Ink is fixed to the material, you can scratch it off some materials. This had been a problem with original formula Mutoh bio-ink (now MUBIO), with Staedtler water-based Lumocolor, and with most other inks until UV-cured ink because available. Although you can scratch UV-cured ink off some surfaces, in general it works better than any other inks on diverse materials without needing precoating. Printer names that use Magic Ink are confusing? One source lists the printer names as Eastech EJ-7000 magic, EJ-9000 magic, EJ-1200, EJ-1600, EJ-2600 magic. Yet a brochure lists the printer name as the Corona M1004 and Corona M1008. Is this just for textiles? But the brochure for the Corona name lists printing on wood, mirrors, aluminum metal plates. It is also not clear the relationship between Practical Concept Printing System of Saitama, Japan, and Eastech of Taiwan and Thailand. The printers were not available to inspect at SGIA 2008, VISCOM Italy 2008, or VISCOM Germany 2008. But at each of these major international sign printing equipment trade shows there were other newer successful alternative inks, so we are switching our coverage to the inks that are more easily accessible for inspection at the key trade shows. SmartColor is a company in Italy that uses other innovative inks to print on thick and rigid materials. 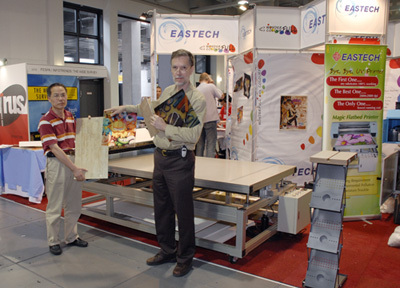 Nicholas Hellmuth showing some items of different materials printed at Eastech printer with the "Magic Ink" at Fespa Trade Show, 2007. My other favorite atypical ink was Lumocolor, from Staedtler. Unfortunately no printer manufacturer was willing to risk designing a special printer to handle its heating and laminating requirements on some materials. This is unfortunate since a heating unit is simple and in-line lamination has now also been achieved. Although Lumocolor ink never made it into mass-production, a newer ink that “prints on everything” is becoming available from Sepiax. After FESPA Digital Europe 2009 it was possible to visit the Sepiax Ink Technology demo room and offices in southern Austria. FLAAR spent two days with Sepiax testing primarily signage materials. Sepiax is one of the few water-based inks that will print on uncoated DuPont Tyvek and on PVC. The HP latex ink is so new, and its actual pros and cons are totally unknown outside press releases. But most of our thousands of readers will want to learn about it, so I cover HP latex ink on two of our sites: HP latex ink elsewhere here on the wide-format site and another page on the HP latex ink on the large format site (which is dedicated to signage printers). The downside of HP latex ink is that you can't use it on thick or rigid materials because the heating system works (so far) only on thin roll-fed substrates. And HP latex ink is intended for normal signage materials; there is no attempt by HP to brand their latex ink as printing on anything and everything. Sepiax ink does not require a furnace inside the printer to handle its ink. All Sepiax ink needs are the normal heaters that are already inside a Mimaki, Mutoh, or Roland eco-solvent printer. 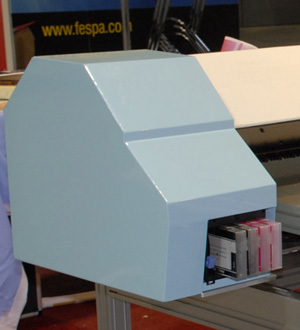 Side view of Eastech printer that use the Magic Ink at FESPA Trade Show, 2007. I had interest to continue studying the Magic Ink from Eastech, but this proved not realistic, so I decided to see what other similar inks existed, inks that were easier to access, easier to learn about, and with printers that were already out of beta-stage. At VISCOM Italy I found diverse unusual kinds of inks that were significantly more sophisticated in the sense of having large companies standing behind them. So far there is no one universal ink that can print on everything other than UV-cured inks. At SGIA and other signage printer trade shows I always see one or two booths which feature desktop sized printers and an ink that “prints on everything.” Most recently it was LogoJet. It claims it prints on wood, plastics, metals, glass & more! But there is no information on whether priming is needed and whether lamination is necessary. Eastech is trying to avoid the need of primers but has not yet escaped the need for lamination. The other issue is that Epson printheads are too slow for serious production of signage. HP Designjet 65500 is using thermal printheads which, especially in clusters, are faster. There are a few other inks sold in the US and in Europe by various Korean companies: you can see their booth at SGIA (LogoJet) in the US or VISCOM trade shows in Europe. Their ink is aimed at precisely the same markets as is Magic Ink of Eastech. The problem in all cases is similar: there is no recognizable brand name with international clout for any of these inks. All are regional or local. And the printers tend to be modified Epsons, or at least use Epson printheads, which guarantees these machines will be slow: not fast enough for serious production at a commercial level. For niche market printing in small printshops some of these printers may be okay if you are in the same city as the manufacturer or distributor, but anywhere else there is not much realistic hope for consistent tech support. Kiian is trying with a new alcohol ink, but they have no manufacturing capability to produce printers that can provide the heater that this ink requires. Trying to use Chinese printers is an invitation to repeating the mistakes of other companies who have tried that route…and failed. So even if the Kiian ink is good, without a printer that can meet Western European and North American standards, the ink is unlikely to succeed. Today (in 2010) since 2009 water-based inks are preferred over any eco-solvent ink. Sepiax is one of the few water-based inks that can print on PVC, uncoated DuPont Tyvek, aluminum foil, metal, wood, newsprint and other uncoated paper, and diverse other materials. Here is Nicholas in the main office and demo room of Sepiax, an innovative water-based ink from Austria. As you notice, FLAAR is very interested in learning which of the innovative new inks will replace all solvent inks and gradually rival even UV-cured in some applications. We support all innovative research that is improving UV-cured ink solutions, but feel that other inks also have a place in the world of both wide-format signage and wide-format printing for décor and architectural decoration. Today, in 2010, there are several inks that are seeking to first replace eco-solvent and mild-solvent inks with water-based inks. Sepiax, for example, can print on PVC and uncoated Tyvek. The next step is to have these water based inks match and gradually surpass the potential of UV-cured ink. Kiian had only one prototype line of printers that uses their inks. Much Colours has a significantly more advanced line of printers that actually exist in finished state, but I have never seen their Practika machines exhibited anywhere else in the world. And I did not notice them at DRUPA (if they were there, they were nearly invisible, and not one other analyst mentioned them). If the MuchColour Practika printers appear at FESPA 2009, that will be a step in the right direction. But as typical of a niche-market solution, they were not visible at FESPA 2009. Yet there are now over 45 manufacturers of printers that use UV-cured ink, and over 101 models of UV printers have been launched since 1997. Several more UV printers have already been launched in 2009. This does not mean that UV-cured ink is perfect: Eastech gave up working with UV ink already several years ago, due to the extreme heat requirements and other issues. The large Swiss company, Luscher, gave up on UV printer manufacturing and development after unsuccessful technology experiences. DuPont got creamed in the market (because they tried to get Chinese-made UV printers to actually function). But since 2008 other companies, instead of giving up, have switched to using LED curing which is cooler than traditional mercury-arc curing lamps. And Gerber is also experimenting with cool lamps for its cationic ink chemistry (for the Gerber Solara ion flatbed UV printers). 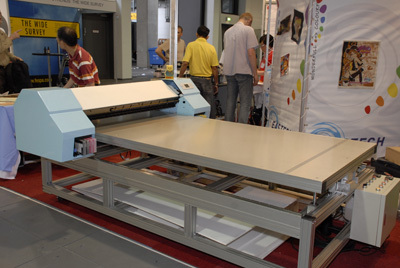 At FESPA 2009, however, there were several innovative flatbed printers using new ink chemistries other than UV. These are primarily European inks, so they have a bit more international coverage. FLAAR was at FESPA Digital every day, gathering information, and then in September Dr Nicholas Hellmuth presented a three hour summary of the trends of 2008-2009-2010 during an epic presentation in Chicago at Print '09 (GraphExpo '09). One hour of this presentation will be devoted to the new inks from several European companies, as well as the special flatbed printers that utilize these inks. FLAAR will be featuring Sepiax and Kiian inks in this presentation, as well as any other ink whose demo room hosts a visit so we can undertake testing and evaluation. At Graphics of the Americas (late February 2010) there was an updated version of this lecture from FLAAR on innovative inks that compete with UV, eco-solvent, and HP latex inks. If you would like this information, new FLAAR Reports in March 2010 will discuss the pros and cons of Sepiax compared with HP latex ink. Most recently updated March 2, 2010 after seeing Sepiax printing at Graphics of the Americas show in Miami. First posted March 18, 2008. Updated June 5, 2008, at DRUPA. Updated July 14, 2008, at Eastech facilities in Bangkok, Thailand. Updated December 1, 2008 and January 26, 2009. Updated May 21, 2009.